Civil Disobedience Campaign. "Overcoming Male Oppression". 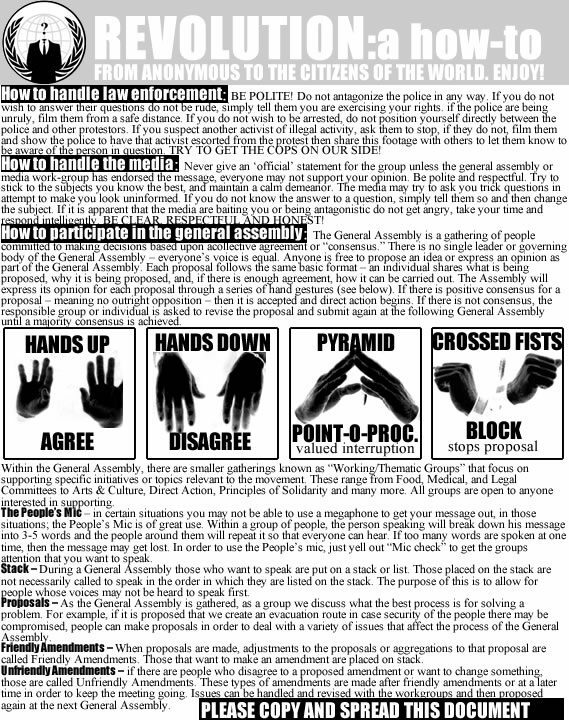 Blockade the Bombers: June 14, 1982 : Civil Disobedience Campaign Handbook. New York, NY: Civil Disobedience Campaign, 1982. Retrieved 2011-10-12. Common Wheel Collective. Collective Book on Collective Process. Web. Retrieved 2011-10-18. Degenhardt, Friedrich. "Consensus: a colourful farewell to majority rule". World Council of Churches. Retrieved 2007-01-17. Retrieved 2011-10-13. Dressler, Larry. Consensus Through Conversation: How to Achieve High-Commitment Decisions. San Francisco: Berrett-Koehler Publishers, 2006. Print. Eichler, Mike. Consensus Organizing: Building Communities of Mutual Self-Interest. Thousand Oaks: Sage Publications, 2007. Print. Estes, Caroline. Consensus. In Context 7 (Autumn 1984). Retrieved 2011-10-18. Gelderloos, Peter. Consensus: A New Handbook for Grassroots Political, Social and Environmental Groups. Tucson, AZ: See Sharp Press, 2006. Print. Hartnett, Tim. Consensus-oriented Decision-Making: The Codm Model for Facilitating Groups to Widespread Agreement. Gabriola, BC: New Society Publishers, 2011. Print. Lakey, Berit. "Meeting Facilitation --The No-Magic Method". Network Service Collective, 1975. Retrieved 2011-10-13. Lance, Mark. Fetishizing Process. Institute for Anarchist Studies, Summer 2005. Landry, Charle; David Morley; Russell Southwood; and Patrick Wright. Making Changes: The collective decides... "The Collective Decides" is excerpted from: Landry, Charles. What a Way to Run a Railroad: An Analysis of Radical Failure. London: Comedia Pub. Group, 1985. Retrieved 2011-10-12. Levine, Cathy. The Tyranny of Tyranny. 1979. Web. Retrieved 2011-10-16. McGann, Anthony J. The Logic of Democracy: Reconciling Equality, Deliberation, and Minority Protection. Ann Arbor: University of Michigan Press, 2006. Print. Meerkatmedia. Consensus (Occupy Wall Street). Uploaded 2011-10-13. Retrieved 2011-10-14. Video. Perkins, Rudy. "Breaking with Libertarian Dogma: Lessons from the Anti-Nuclear Struggle" Black Rose, Fall 1979, p. 15. Retrieved 2011-10-12. Ryan, Howard. Blocking Progress: Consensus Decision Making in the Anti-Nuclear Movement. Berkeley, CA: Overthrow Cluster, Livermore Action Group, 1983. Print. Sandelin, Rob. "Consensus Basics, Ingredients of successful consensus process". Northwest Intentional Communities Association guide to consensus. Northwest Intentional Communities Association. Retrieved 2011-10-12. Seeds for Change. "Consensus decision making". Retrieved 2011-10-13. Sitrin, Marina. Horizontalism: Voices of Popular Power in Argentina. Edinburgh, Scotland: AK Press, 2006. Print. Vannucci, Delfina, and Richard Singer. Come Hell or High Water: A Handbook on Collective Process Gone Awry. Edinburgh: A K Press, 2010. Print. Wetzel, Tom. On Organization. Internet Resource. Retrieved 2011-10-12. "What is Consensus" The Connexions Digest. Toronto: Connexions Information Sharing Service, 1988. Retrieved 2011-10-12.